I can’t help but get the feeling that Sam’s Club is desperate for memberships. But that’s good news for you if you want a membership. There should be no reason to pay full price for a Sam’s Club Membership because there is always a deal! 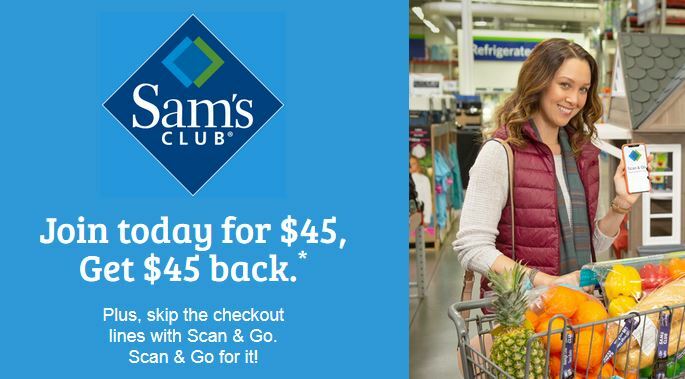 Sign up for Sam’s Club right now for $45 and you’ll get a $45 gift card! Use it in store and try out the new Scan & Go feature! Use the Sam’s Club app in store to scan your items, pay from the app and skip the checkout line! What a genius idea! Sign up now for this FREE deal! Get a one year Sam’s Club Membership, a $45 gift card back and you’ll have a full year to take advantage of the Sam’s Club benefits! It’s as easy as 1, 2, 3. Sign up, save up, pick up. Get Members-only pricing on merchandise and services and Instant Savings from top brands above already low prices. Fuel station, full line pharmacy and optical center available at select locations.